It was at the LA 140Conf where I first heard about how MySpace was really focusing heavily on Lifestreaming. They have continued to push forward on this path and amidst the departure of Monica Keller, who was the catalyst for delivering it, they keep moving forward. I saw over on TechCrunch that MySpace has apparently quietly unleashed Streams (what they’re calling their Lifestreaming feature) onto profile pages. They’re doing this quietly without a formal announcement perhaps to see how it performs, is received, and if any problems are encountered (take note Google re: Buzz). The idea is to hit users over the head with new stuff when they come to MySpace. New people they should be meeting. Movie trailers they should watch. Games they may want to play perhaps against other MySpace users, music they should listen to, articles they should read. Etc. 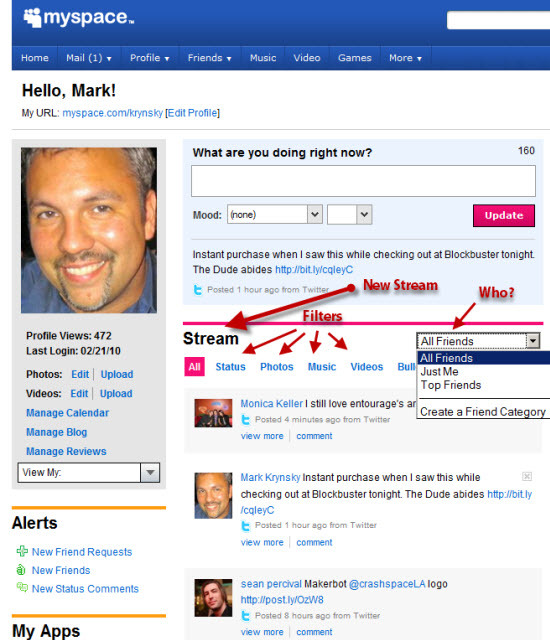 The activity stream that MySpace recently launched will be the backbone of Discovery, but other MySpace products will feed into this as well. Then after hearing about this release I read over at Billboard that MySpace has quietly begun testing a new “In-Stream” ad unit which will be placed at the bottom of these new stream pages. So apparently this rollout seems to have been released tied to a monetization strategy from the beginning. This will be interesting to monitor as it’s the first time I’ve seen an ad strategy released around a Lifestream. This is very cool and how Google should have rolled out Buzz. I guess this will be how Facebook rolls out their “In-Stream” ads.